Plymag, in keeping with its innovative nature, continues its process of internationalisation by crossing borders. 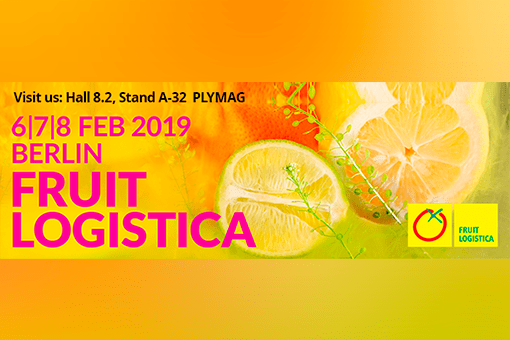 Among its recent activity, we find its participation in the trade fair Fruit Logística 2019, which will take place from 6 to 8 February in Berlin. Fruit Logística is the most important fair for the fruit and vegetable sector, bringing together more and more professionals from this area each year. Among these are providers, importers and researchers in this industry, as well as other interested parties. In this way, the fair encompasses all the areas involved, giving both small companies and the great global names an opportunity. For everyone who takes part, this meeting represents the perfect opportunity for staying in touch with the trends in the sector. This means that the different parties enjoy these few days, sharing best practices and their latest innovations, from their processes of product development to their distribution chains. To indicate its scope, each year over 78,000 people attend, offering space for more than 3000 exhibitors from 84 different countries, to judge by the data available on the previous event. Against this backdrop, Plymag will be present at this Berlin fair for the first time ever. Under its auspices, we will be able to meet many of our international customers. In addition, we will have a chance to broaden new lines of business in countries where we are not yet present. Apart from our stand, we will seize the chance to present our new catalogue, in which a wide variety of products can be found, grouped according to their features and properties into nine families. As this is a platform which prioritises technological and process innovation, the company will place the emphasis on its range based on seaweed extracts, a field in which it is a pioneer. International expansion is on our short-term horizon. At the moment, we are present in more than 20 countries, a figure constantly increasing, and which we expect to boost by our presence at Fruit Logística. This event represents the perfect setting for a company like Plymag which, after 40 years of experience in the sector, is not just a benchmark around the world, but also works continually on developing new certified products. We harness this objective with our own efforts, whose aim is always to attain the maximum yield for the different kinds of crops, trying to go one step beyond.